At the end of December 2010, we wrote about an original screen used stunt knife that was used during the filming of Jason Lives: Friday the 13th Part 6. The stunt knife itself was cast from a mold which was made from a real metal knife. That original metal knife was created by effects artist Bill Forsche. Mr. Forsche crafted the knife together using two different knives. The blade came from one knife while the handle was originally a compass. Bill has mentioned in the past that the real metal knife was not screen used but only used as a positive for the mold. The mold that was created from this hybrid metal knife was used to create stunt and F/X knives. 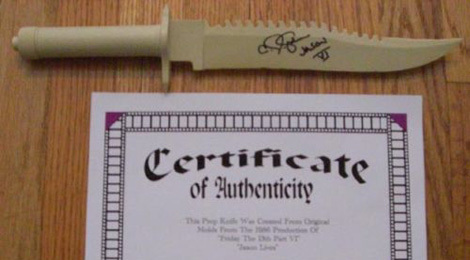 Now, a prop knife has appeared on Ebay for auction that mentions it is a prop knife from Jason Lives. The knife itself is made of plastic and was never used on screen. The knife was cast from a newer mold created by Bill Forsche before he sold the metal knife hybrid to a collector. Bill created a few of these replica knives to sell on eBay a few years ago. 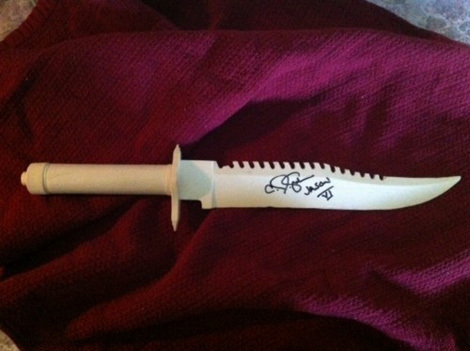 The prop knife is signed by C.J. Graham, which makes it a great collectible. However, buyers, please be aware that this knife was never used on-screen nor did it come from a mold created for use during production of the film. Check out the image of the knife for sale below and if you want a replica prop created from the original positive used for production, you have found your item!